Gareth’s wife Viivi and their girls, Siina and Tiia, with Barbara and David standing behind. Siina sets the table for a meal in the main saloon. One year there were 16 gathered around it for Christmas dinner, an occasion when the slide-out servery station came into its own. 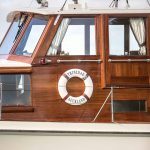 She was constructed in 1964 by Salthouse Boatbuilders for original owner John Mitchell. With no screens to distract them, sisters Siina and Tiia are used to making their own fun. Barbara prepares simple meals from the galley kitchen using fresh herbs and vegetables from their home garden in Coatesville. Her 127-horsepower six-cylinder diesel motor manufacturing by Gardner Marine Diesel cruises along at nine knots and is economical at 1300rpm. Although this 50-year old launch is still original in many ways, an auto pilot system has been installed so Captain Cooke can take it easy on long journeys. Laying anchor is a maritime ritual where silence speaks volumes. 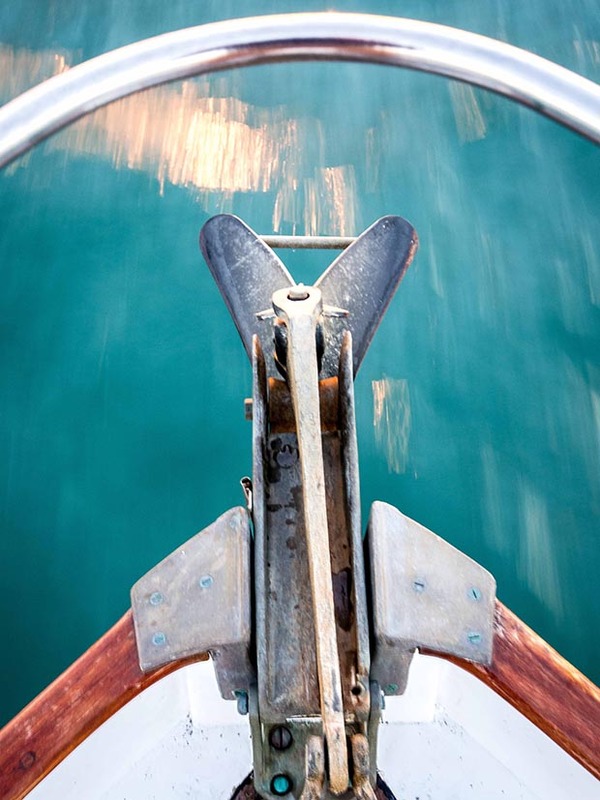 It’s a two-person task that takes concentration and quiet communication between the wheelhouse and the bow. As a marital test, David and Barbara Cooke have it nailed. “Nine times out of 10 it works,” laughs Barbara. 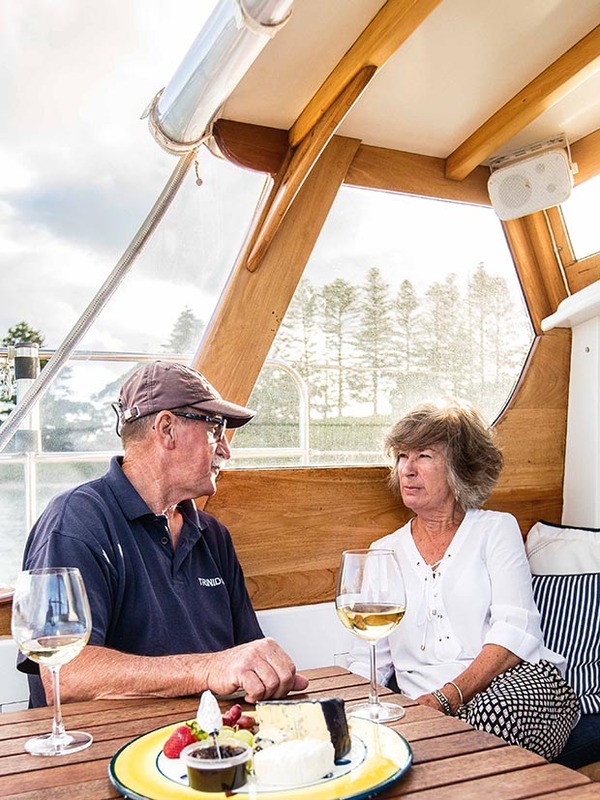 The ceremony of settling their 52-foot (19-odd metres) classic launch into the shelter of a bay has become second nature to the couple after 16 years of ownership. 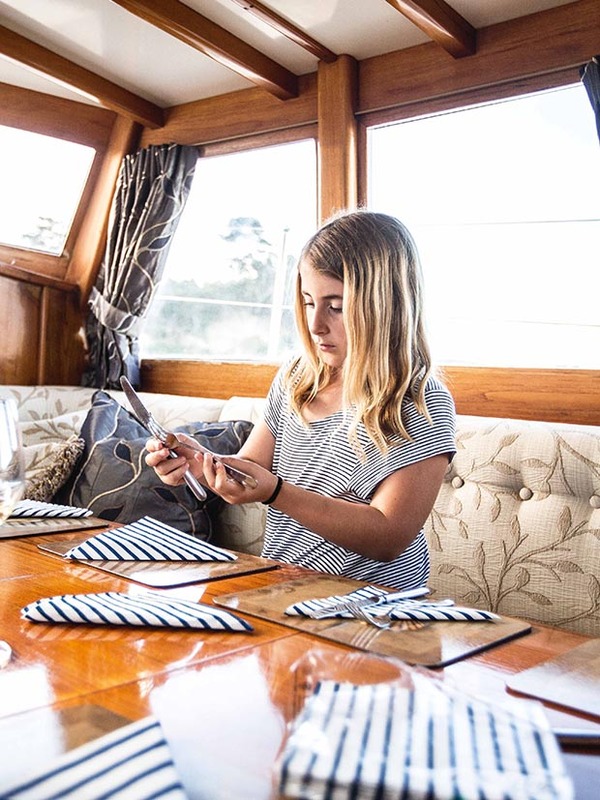 The routines of on-board life may have relaxed into familiarity but what never changes is the excitement of exploration, whether it’s a day trip or a summer-long adventure. 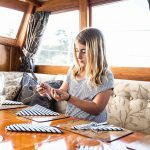 In 1956 John Salthouse set up a boatbuilder’s yard with a makeshift tin shed based on an order for eight 12-foot dinghies. He sold them for 65 pounds each. 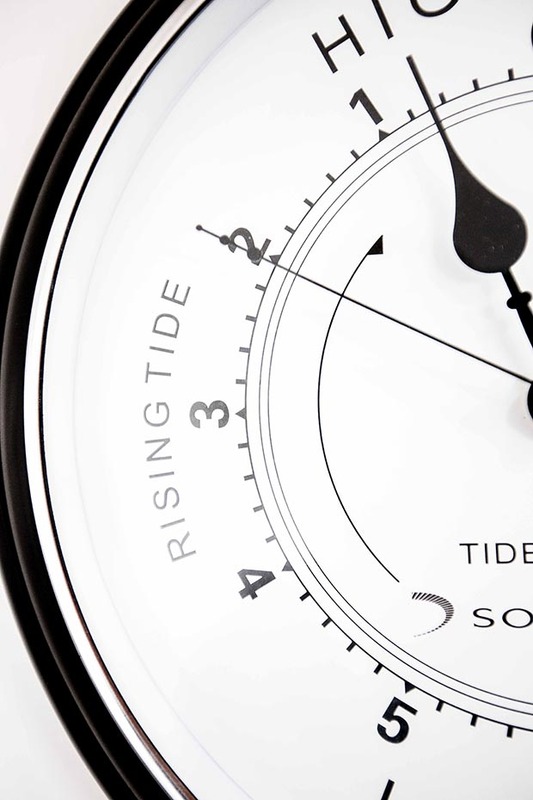 Today the Greenhithe-based business is at the forefront of the luxury and high-performance yacht markets. 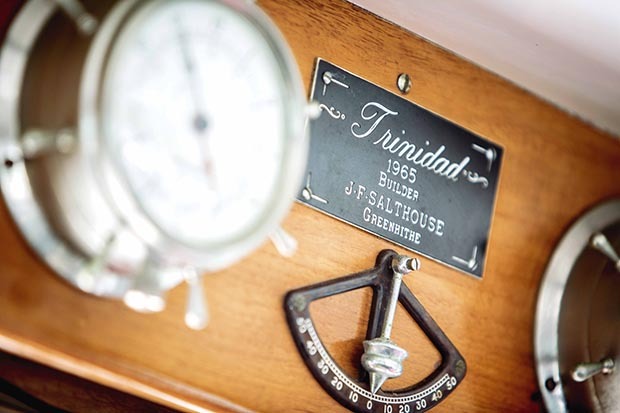 One of its best-known boats is Trinidad, a pleasure cruiser launched in 1965. “The original owner was John Mitchell who served in the war on HMS Trinidad,” explains Barbara. The luckless cruiser was scuttled on 15 May 1942 after having been damaged first by her own faulty torpedo, then by German bombers. 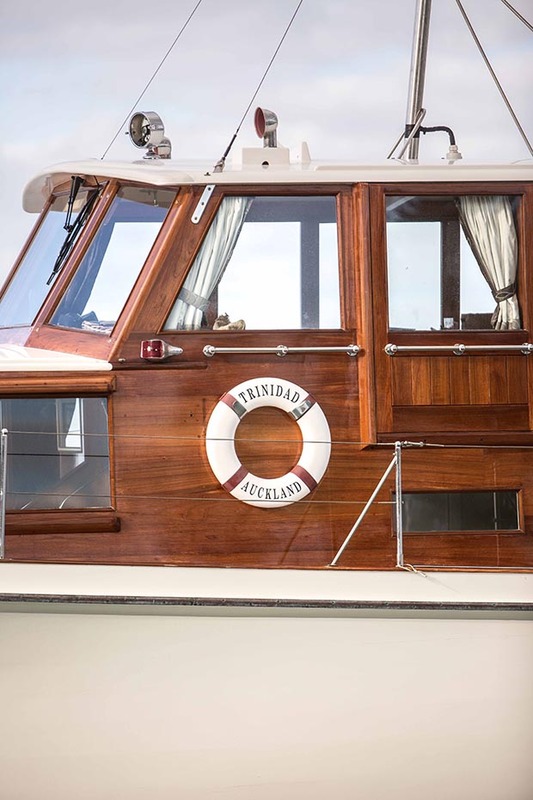 Mitchell resurrected her memory in a boat that was to enjoy a much-loved and long-starring presence in the Waitemata. When the Cookes first saw her on a berth at Bayswater, buying her just felt right. Besides, there was already a close connection. “Our daughter Delayne is married to Greg Salthouse,” says Barbara. 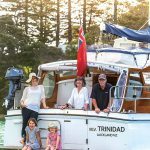 With a triple-skin kauri hull and teak decks and cabin tops, Trinidad has the beamy, voluptuous lines evocative of a Monroe-esque era. Her craftsmanship is exquisite. 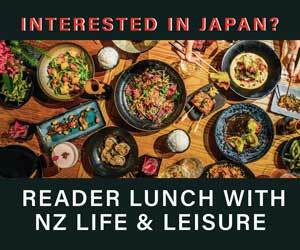 “The kauri was steamed into shape,” explains David. “The timbers are joined with copper rivets – not glue or nails.” Sitting at 22 tonnes in the water, speed is not her essence. She may be no racehorse but she has other assets. Since Mitchell was a strapping 1.93 metres, Trinidad was built taller and, to keep the proportions in balance, longer than the initial brief. 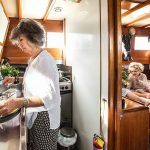 There’s plenty of headroom in the galley and main saloon, and the berths are generous. That seems just as well since, among the Cookes, Trinidad is known as the “mother ship”. At Christmas time and in the holidays when the days stretch to the horizon, a family flotilla is formed. 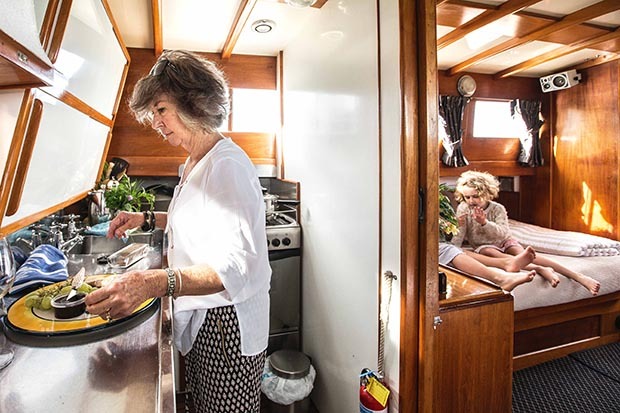 “We have three grown-up children and they all have boats,” says Barbara, who lives up to her surname and becomes chief galley hand, using fresh vegetables from the couple’s 4.45-hectare lifestyle block in Coatesville. “We’re pretty self-sufficient there. 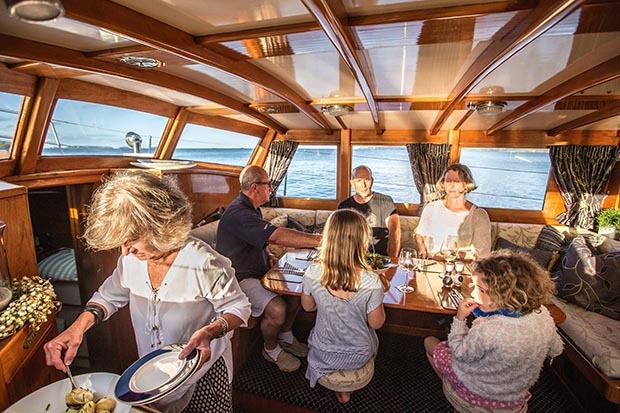 We have an extensive vege garden and our own lambs.” On longer journeys, she’ll grow herbs on board and a built-in, pull-out servery station comes in handy for large gatherings. Among the leisurely hours of cruising and many an anchorage in gentle bays, there have been scary moments. The day katabatic winds blasted down the valley and exploded into the water of the Marlborough Sounds in 80-knot gales, the couple followed the Picton ferry back into port. “It was listing at an incredible angle,” says David. 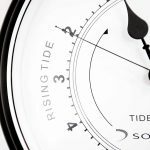 Then there was the time they were journeying around the East Cape, a stretch of ocean notorious for having its own agenda, as massive waves thrashed over the bow. 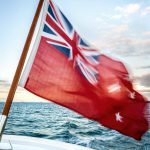 Happily such drama at sea is limited: spilt wine is far more common and the couple, undeterred, plan to circumnavigate New Zealand in summer next year. David, who considers they are merely temporary caretakers of Trinidad, has in his files a typewritten letter received from the Gardner Engines company headquarters in Eccles, Manchester. Dated 6 September 1963, it makes the polite suggestion to reconsider the electrical equipment the owners propose to install. The writer is adamant such electrics are “totally unsuitable” and bound to give “endless trouble”. Wisely, this advice must have been heeded. 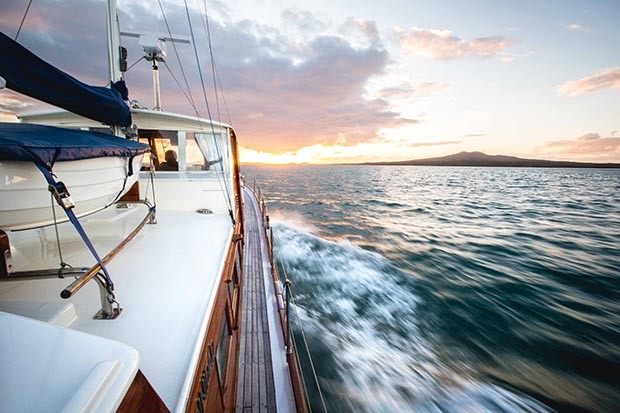 On a 63-hour voyage to the South Island, the 50-years-young diesel engine operated flawlessly. The old girl, smart and steady, is still going strong. 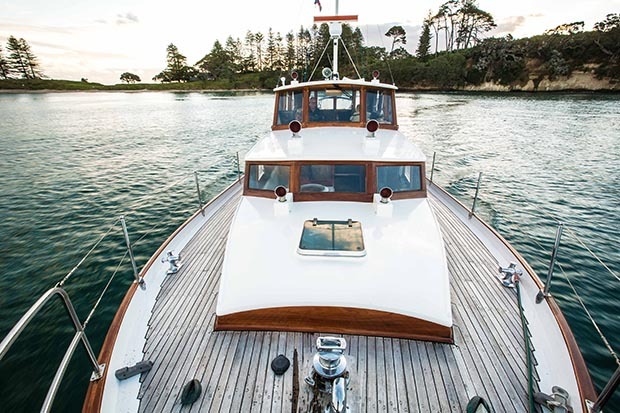 • She was constructed in 1964 by Salthouse Boatbuilders for original owner John Mitchell. 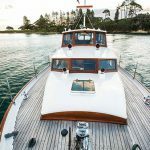 • Her 127-horsepower six-cylinder diesel motor manufactured by Gardner Marine Diesel cruises along at nine knots and is economical at 1300rpm. 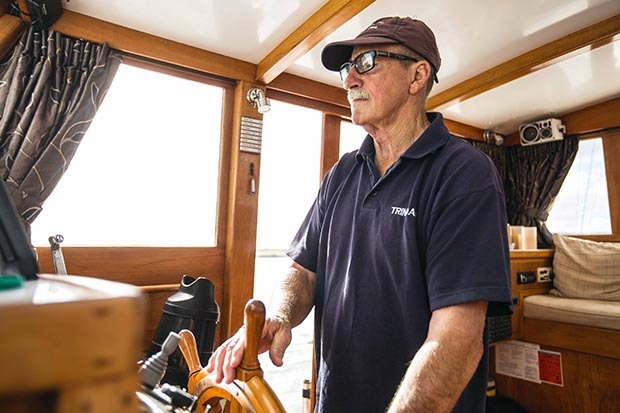 • In the 1970s she was rescued from“death row” by Auckland boatie Eddie Higgins who found her in a sorry state in Sydney, made her seaworthy again and brought her back home – a seven-day crossing. • David and Barbara Cooke bought Trinidad in February 2000. 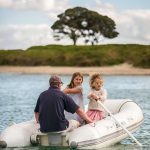 • Bon Accord Harbour in Kawau Island has a brilliant boating club which was refurbished and upgraded a few years ago and provides a great service to the boating community. • Man O’ War Bay at the eastern end of Waiheke has a beachfront cellar door and a setting that is rather Somerset Maugham with wonderful cane armchairs. You can see over to the Coromandel coastline on a good day and the kids can play pétanque, skittles and swingball on the lawn. 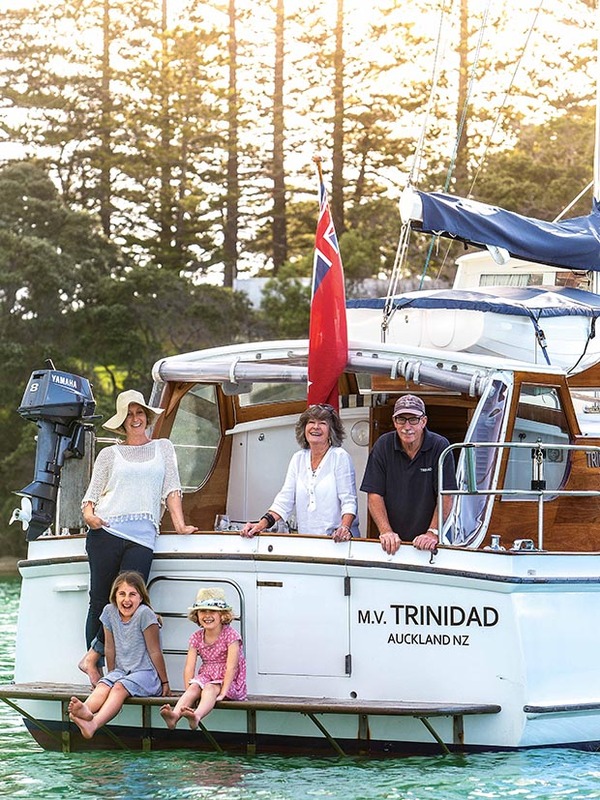 • The Bay of Islands and Whangaroa are also some of the family’s favourite cruising grounds. David: I love a big red such as an Aussie shiraz but Hawke’s Bay chardonnays are pretty darn good too. At the moment, we’re drinking Beach House and Babich. One of my favourite wine shops is First Glass in Takapuna, or I’ll shop online at Advintage (advintage.co.nz). Barbara: We do our own home-kill lamb and I also like to make my own homemade mayonnaise which I store and serve from a mason jar. David makes olive bread in the breadmaker, which we have in a slide-out drawer instead of a microwave. I try not to make too many cakes on board but, since I have a full domestic gas oven, an easy one to do is a date cake because it has the advantage of being prepared all in one bowl. Barbara: Serious Fun, the biography of Alan Gibbs. We went on the sculpture walk around Gibbs Farm in the Kaipara recently so I’m re-reading this book, which is an open and honest account of his life. 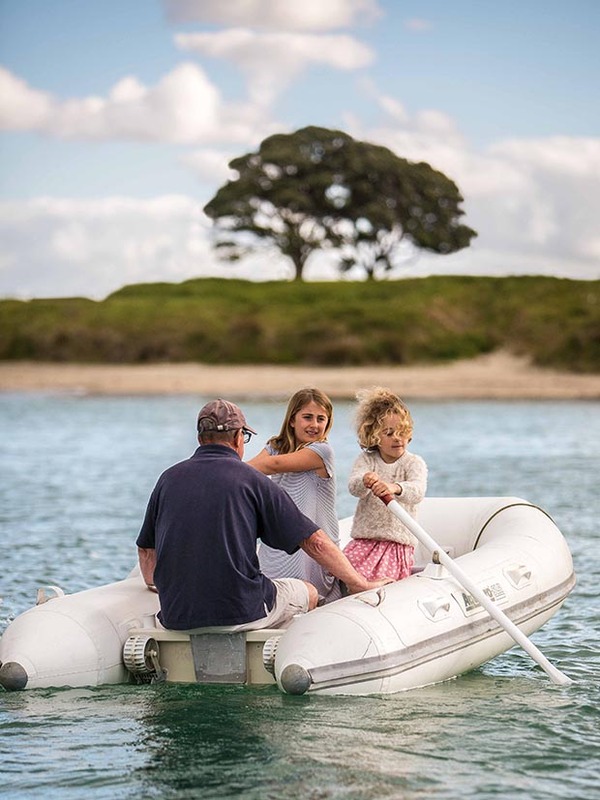 And To the Islands by Kerry Howe who kayaked around the Hauraki Gulf from Auckland to Barrier and up north. 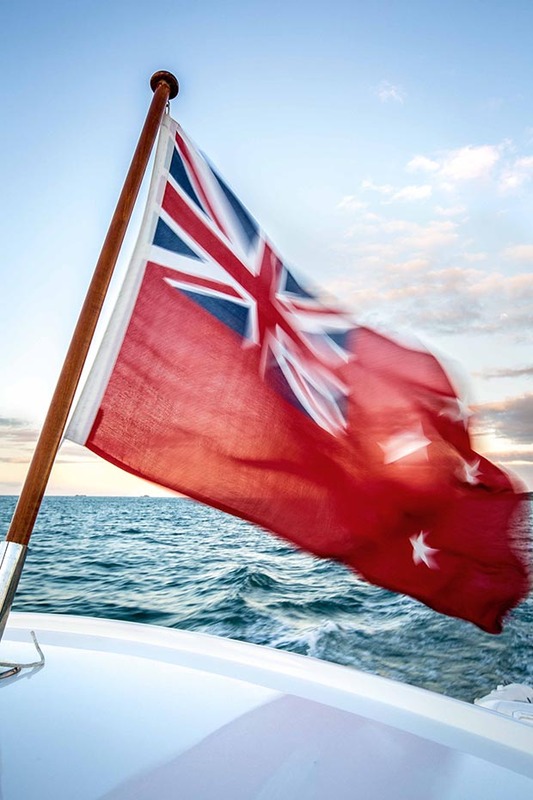 It’s an enlightening story on the history of the islands in the Hauraki Gulf. David: Hemingway’s Boat: Everything he Loved in Life, and Lost by Paul Hendrickson is the perfect book for boaties, particularly those who love sports fishing. It’s a completely different view of Hemingway’s life from 1934 to 1961, and the story hangs together around his beloved classic boat Pilar. Barbara: Two of our granddaughters – Siina and Tiia – like to entertain us with the ukulele. At the moment they live on a boat at North Harbour while their house is being built. A fellow boat resident taught them how to play Ode to Joy by Beethoven.